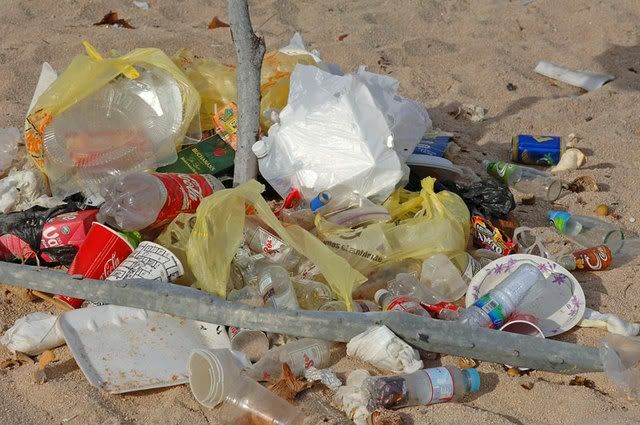 Life's a Beach | Expat Life in Playa del Carmen : Recycling in Playa del Carmen - How are we doing in 2008? Over the past four years, I have seen the concept of recycling evolve from a "silly notion" promoted only by a bunch of "gringos" to a full on Cultural Revolution. Rarely a day goes by that I don't receive an email from someone, Ex-pat or Mexican National, reminding me about a recycling drive or a newly established drop-off area. When we arrived here in 2004, the only "recycling" available to us was saving cans for our babysitter, Lydia, to sell and turning in our cases of empty Sol and Dos Equis bottles for fresh, cold, full ones. Many people, when they first move here, are shocked and disgusted with the amount of waste and refuse that can be found littering any unclaimed sliver of property. Since we moved to Mexico, I have heard more than a few "interesting" hypothesis about why the Mexicans "appear" to care so little for their environment and the beauty of their city and its beaches. Many of these conclusions come from folks whose knowledge of this area and its history is limited. 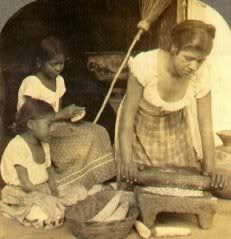 Others, suggesting that Mexicans are simply too lazy to clean up after themselves or too dirty to notice the difference, are based in nothing more than ignorance and racism. In "Anytown", USA convenience products were making a big splash in the households of everyday Americans. 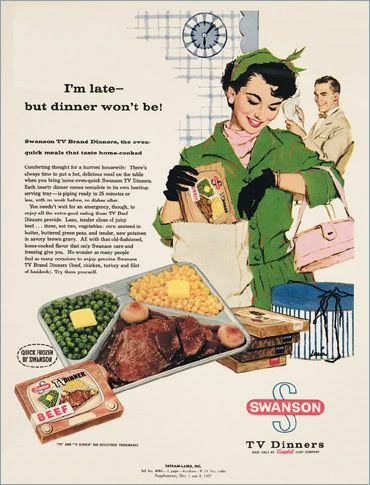 Packaged, processed affordable meals made cooking a snap and new fangled cleaning products promised to shave hours off of the back-breaking, mind-numbing daily activities of the average homemaker. The explosive popularity of television in the home made attractive packaging for all these new products as important as the product itself. The economy was strong. Consumption was high. The "American Dream" was being lived to its fullest and advertised nightly in every living room across the country! Any resulting waste was picked up and removed systematically by well organized public or private waste management companies. Once the garbage left the curb, little thought was given to its destination by Mr. and Mrs. Homeowner. In contrast, 60 years ago, the city of Playa del Carmen was a mere speck on the map of the world. A small wooden dock servicing a few families of fishermen and the chicle farmers, generally ex-convicts banished to the jungle and the scourge of the region. Small coconut plantations dotted the coast and milpa farmers worked the interior, providing the food staple, masa, for their villages. The region was dangerous and sparsely populated. People worked the land, raised livestock and were completely self sufficient. The master-plan that would become Cancun was not even a glimmer in the eyes of FONATUR. Quintana Roo would not be recognized as a sovereign state in Mexico until 1974! As a point of reference, Alaska became the 49th United State in 1959. With so few inhabitants spread out across such a large area, their impact on the environment was minimal. The only waste created was all naturally biodegradable. All meals were prepared, cooked and served using hand-made earthenware vessels and large leaves from indigenous fruit trees. Leaves and peels were tossed into the jungle where they broke down and enriched the soil. When the beauty and value of the Riviera Maya was finally realized by the outside world, change came swiftly and with little or no regard for the people who had called the jungle home for centuries. Development and tourism brought demand for modern products and "first world" conveniences. Local villages now had corner stores which sold new and fascinating foods and beverages as soon as they became available. In their excitement to try each and every strange delicacy that made it to the shelves of the local tiendita, people gave little thought to the bits of pretty colored paper and plastic these treats were wrapped in. And so, as were thousands of years worth of banana peels and leaves before them, they were tossed to the ground. But we are making changes and we are seeing results. In 2006, Ana Garcia, a young mother, originally from Mexico City, started a grassroots organization called Biostandard: its mission, to give real meaning to the words "Reduce, Reuse, Recycle" in her new home, Playa del Carmen. Her company and her ideas drew a lot of attention and support, particularly from other young like-minded women living in this area. Soon, the Biostandard founder and her enthusiastic team were organizing seminars in the local schools, teaching students and parents alike how to reduce the amount of waste we all create and in doing so live healthier lives. Biostandard provided recycled, biodegradable plastic products (plates, forks, spoons, take-out containers) to some of the most prominent area businesses such as Grupo Xcaret and Dolphin Discovery. They also distributed a line of biodegradable household cleaning products to reduce our daily exposure to chemicals that damage our environment and may cause health concerns in the future. 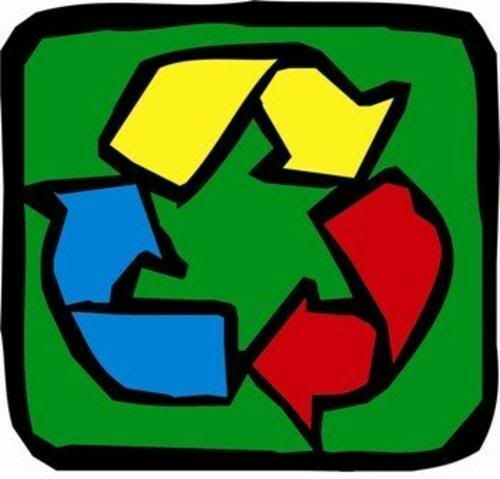 Ana now works with a similar organization MAREMEX that evaluates the waste generated by local businesses, organizations, schools, hotels and even families, then, designs and implements recycling programs tailored specifically to the needs of those particular groups. In 2007, recycling and local supporters in the Riviera Maya got a real boost from the Environment Agency of Solidaridad (EAS). In coordination with environmental NGOs , private enterprises and concerned citizens, an enormous collection of recyclable items was organized to benefit of the communities of Playa del Carmen, Akumal and Tulum. All the cardboard collected that day was donated to the National Commission of Free Textbooks for the production of free textbooks and educational materials. Local residents were offered various workshops on creating handcrafts and toys from recyclable waste as well as instruction on how to conserve local resources and reduce waste in their everyday lives. At this time, the EAS announced a groundbreaking initiative, the Municipal Waste Separation Program. By installing "Clean Spots" in readily accessible public areas throughout the city of Playa del Carmen, residents would now be able to easily leave their clean, sorted recyclable waste, thus reducing the amount of trash in the streets and in our municipal landfill. Now, many of the schools run their own independent recycling programs, supervised by the parents and teachers but staffed by the students. 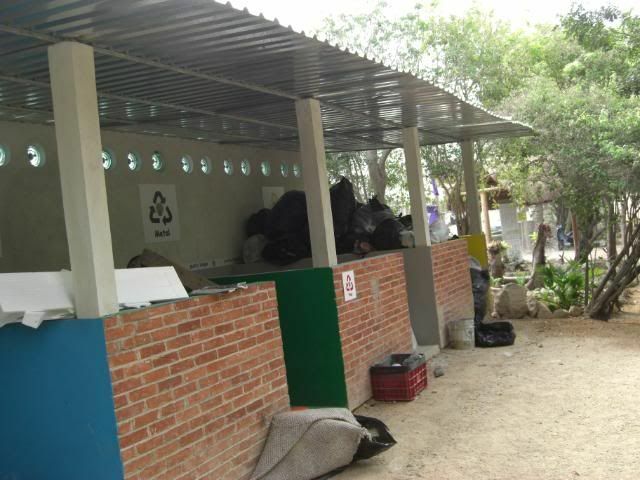 The new Parque la Ceiba, just west of 307 and south of Juarez, has its own internal recycling center, collecting not only what has been discarded in the well-marked modern bins strategically placed around the park but also recyclable items brought in from outside individuals. Many homeowners who offer their villas and condos to vacation renters have set up basic in house recycling facilities for their guests' use and at least one of the major resort chains, RIU, is making strides to reduce the amount of waste generated on their sites, recycle what they can and encourage guests to conserve water and electricity whenever possible. Why, one of Playa del Carmen's hippest, chicest hotels, Basico, is decorated almost entirely with recycled and reused items and materials! The recycling station at La Buena Vida. It's not just the big cities and mega-resorts jumping on the recycling bandwagon. 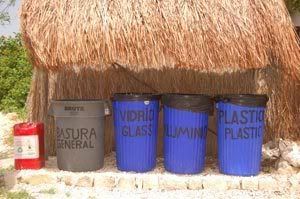 In more remote parts of the Riviera Maya, the idea of recycling seems to be making progress as well. Take a drive down the Tulum beach road and near the entrances to many of the small hotels and private beach homes, you will see small, often handmade, labeled containers where items to be recycled are sorted and left for collection. With wind and solar power the dominant sources of energy to these beach properties, it comes as no surprise that local residents and business owners have made the preservation of their environment as a top priority. Tulum inaugurated its own Centro de Acopio (Recycling Center) in July of 2007 in response to the growing needs of a small town exploding into a city. 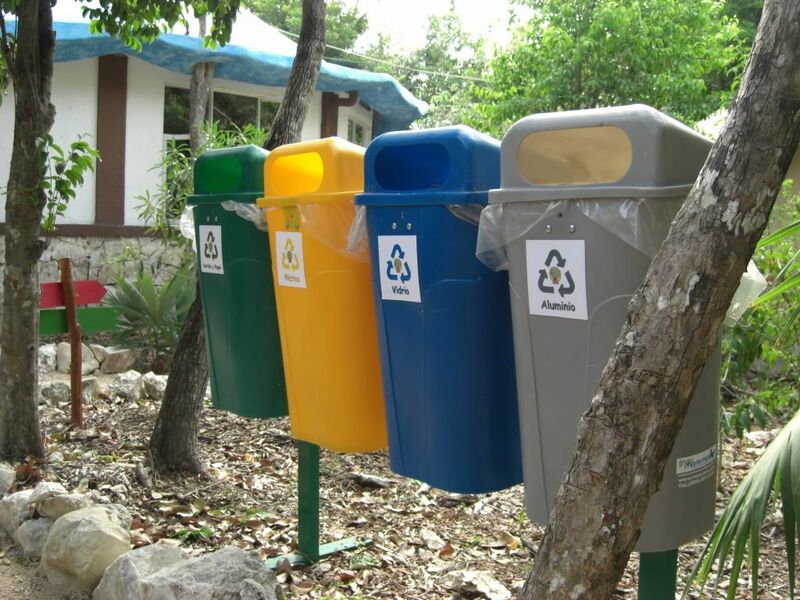 The Centro Ecologico Akumal (CEA) is at the forefront of recycling efforts in the popular seaside town, Akumal, and its pueblo. Attractive, clearly labeled bins have been set up in the village, west of 307, and there is a serviceable recycling station for general use just past the parking area for the main bay. It's not too pretty and looks like it could use a bit more TLC but it is there and has been well used for as long as I can remember. Residents and frequent visitors to Akumal are among the most environmentally concerned and conscientious in all of the Riviera Maya. Recycling, proper waste disposal and the preservation of the reef, the beaches and the wetlands is, and always has been, a top priority here. In Puerto Morelos, as early as 1993, in response to growing concerns about the quality of the ground water and the health of the community, an aggressive campaign was begun in this town, just south of Cancun. 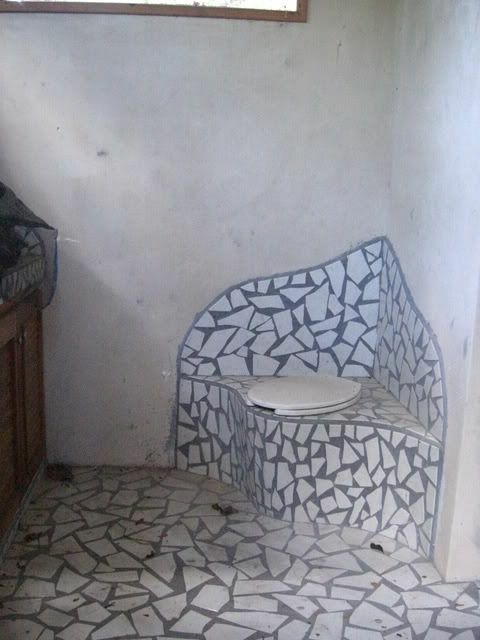 The Puerto Morelos Composting Toilet Project was initiated and implemented with varying degrees of success and acceptance in this tiny fishing village poised just beyond the shadows of Cancun's towering hotels and skyscraping condos. Although initially met with resistance, these toilets are now commonly used throughout the region and have significantly reduced the amount of human waste making its way into the precious potable groundwater. 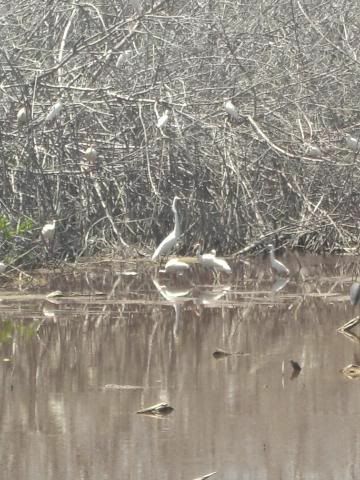 The delicate mangrove that surrounds the town has been and continues to be the focus of great concern, having been ravaged by hurricanes and destroyed by unscrupulous developers. 60 years ago, in "Anytown", USA, were we any more environmentally aware? What kind of recycling programs were in place in "Anytown" USA in the 1950s? What plans did our parents have in place for preserving the earth their children would inherit? What measure of success shall we hold their conservation efforts to? Here we are, about half way through 2008 in Playa del Carmen, Mexico, trying to see how OUR efforts measure up. If you consider how abruptly development has come and how quickly the residents of the area have adapted and accepted the need for lifestyle changes, I think we are doing quite well. I think the progress that has been made in awareness and conservation of the environment is laudable but we still have a long way to go. Too often still, the promise of profit wins out over environmental concerns. Certainly education is the key and the programs and seminars held regularly in local schools help to ensure that future generations recognize the need and possess the skills to preserve this beautiful area. Still, the struggle against what is "easy" and what is "right" will always be played out as it is everywhere in the world. "Clean Spots", municipal recycling stations on the street corners and organized recycling drives are making recycling much more convenient for locals and tourists to properly dispose of items rather than have them left on the beach or tossed in the street. Now provided with information and the proper tools, the people of this region are grasping the concept of recycling whole-heartedly. Community driven programs to preserve and improve green spaces in the city are underway and gaining governmental support. I have even seen signs promoting home composting programs in the small town of Filipe Carrillo Puerto 1 hour south of Tulum! 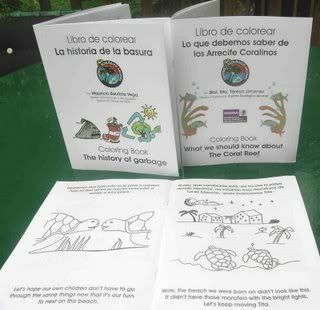 CEA coloring book teaches children how to help save our precious reef. So, yes, conservation, preservation and recycling are high priorities for the residents of this region. With well-regulated controls on commercial development, continued education for those people living in more remote areas of Quintana Roo, the support of private and governmental entities and the cooperation of everyone in the community, the Riviera Maya will continue to be a beautiful place to live and visit for many generations to come. For information on regional recycling programs and conservation efforts, follow the links provided above and see how you too can make a difference. 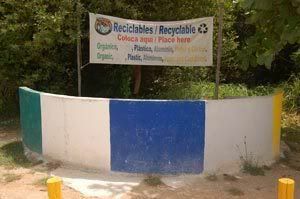 # re: Recycling in Playa del Carmen - How are we doing in 2008? Bravo to these programs and the people who made/make them happen. You sure did your homework for this one! I wish somebody would do something over here on Isla. What a great article! It gives me so much hope for Honduras. I think the comparison to 1950's-60's USA is a very good one. I've often thought that about Honduras. Coincidentally, I was just drafting an article to encourage people in Honduras to do a bit of recycling. I'll definitely be linking to this article. I'm not sure how I ended up on your blog! I have about 30 tabs open at this time, some of them opened this morning and never looked at. But I'm so happy that I found your blog and now I see that the Blogicito is on your blogroll! It's a small blogging world, isn't it? Thank you very much for the link. GREAT article!! So well written! I wish Cancun would get on board! Seems they can't kill the mangroves fast enough around here! Not mention the lamest recycling plan ever!! Btw- that is the prettiest composting toilet I've ever seen! Nice job! Why don't more hotels use permaculture instead of manicured lawns and such...? It is more cost effective, environmentally sound, efficient and requires less maintenance. I guess one thing at a time; thank the stars that there are at least a few recycling programs and nature conservation programs out there!